When my son turned a few months old, I prayed he would start crawling; because my arms screamed from carrying him around all the time. Now that he has started crawling, I dearly wish I could carry him again! My son doesn’t stay put in my arms anymore! It’s like the moment he sees a floor or any surface humanly possible to crawl on; he turns into the North Pole and the floor the South! Why, he is solely responsible for the sparkly clean floors in most of the shopping centres in my city! Ok! Maybe that was taking things a bit too far and not to toot my own horn or anything but this little fella can crawl! 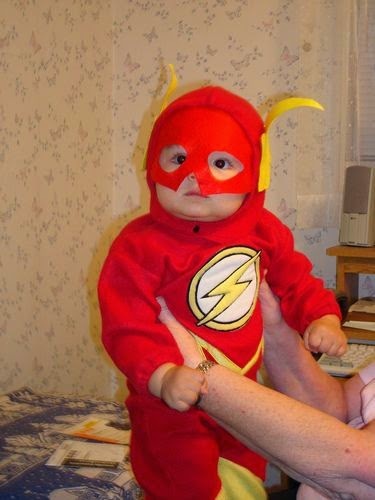 He quite resembles a junior flash on an extreme glucose high!! One major plus that this has brought about is that I’ve managed to lose some post baby poundage and no one’s complaining. The major setback however is how careful we have to be at this stage. Take your eyes off for just a second and I literally mean a second and all hell can break loose! Expensive pottery would be in pieces all over the floor, the baby might fall and bump his head, people could trip over the baby and get hurt (been there, done that)…the list is exhaustive. Over time I have learnt to be a lot more cautious. Once I understood his crawl routine (yes, babies have one!) it was a lot easier to multi task and to safeguard him from bumps and falls. The moment your baby starts showing an amazing aptitude for reaching out and grabbing only the most delicate and expensive items around the house, that’s the time to start “insuring”. In parenting terms (one I just made up actually) it means keeping breakables out of reach. Chuck keeping the house all decorated and gorgeous out the window and start placing all those delicate vases, glass jars and the like out of reach. And whatever you do, do not encourage your baby to throw things off your vanity table. There is a high chance he will repeat the behaviour elsewhere and not everyone is as compromising or adjustable as you or your immediate family. My mum has been over indulgent and allows my son to wreck absolute havoc with the jars, bottles and tubes on her vanity table. I promptly pull him away but the very next day over indulgent granny and stupendously happy grandchild can be seen back at the scene of the crime! Sigh! One must encourage ones baby to explore; BUT there are some places that should be kept strictly off limits; like say stairs, the kitchen, the bathroom and others. This practice must be encouraged until your child is old enough to understand the purpose of a barrier. Once my baby started crawling, he grew tired of the places that I let him explore and was soon rushing to climb up and down the stairs, he made a disgusting habit of crawling into the bathroom and lying down on the wet rug and sweeping clean the floors of the kitchen. I promptly placed wooden barricades that were chin high. The most he could do is stand up, hold onto the barrier and peep in. He seems satisfied with that…for the time being. I had this idiotic notion in my head when my son started crawling: “He can’t get far or get hurt…after all he JUST crawls!” Boy! Was I ever wrong! Trust me when I tell you this; this is no defined capability quotient when it comes to the heights a crawling baby can reach. I once had an urgent call coming in and I picked up my cell phone in the next room. When I came back 3 minutes later, my 10 month old son had climbed the bed, clambered over to the couch and stood like a conquering hero on the head of the couch; happily swatting a fly on the windowsill. I almost needed diapers myself that moment. Ever since then I have never, ever let him out of my sight. Always make sure that your baby in within your eye sight. Don’t take a breather thinking “ok, let him sit around the corner playing. I’ll check on him in a bit.” Bad move mama. The closer you are to him the better! There are of course times when you need to leave your baby under someone’s care for a little while. First off, make sure that you leave your child with ONLY trustworthy relatives, friends or help. Secondly, do not fail to let them in on your child’s crawl routine. There may be some places he prefers playing in, some places that are hazardous, places he throws toys into, the route he takes from one spot to the next. Awareness is key here. Your child shouldn’t take the person looking after him by surprise. He/she should also be clued enough to stop or encourage the child crawling to specific areas. This in effect would be a major relief for you as well as a lot of mishaps can be prevented and explanations of “I didn’t know!”, “Why didn’t you tell me?” can be avoided. Having said all this, I advise you to do not over restrict your baby, as it not only will affect his progress from crawling to walking, it would also thwart his natural instinct to explore. When he crawls into a new, permissible space, be with him throughout. Make sure he is within your reach at all times. I cannot even stress the importance of cleanliness at this stage. Babies develop differently, however, they have one freakishly similar habit: open mouth, insert dirty foot, hands and basically anything off the floor. That is why you always need to scrub clean his hands, knees, feet and face with baby soap and a soft cloth after every crawl session. Using warm, soapy water is ideal. If you are outside, keep baby wet wipes with antibacterial properties handy. A change of clothes or two is an absolute must when away from home. Obviously we have no control over cleanliness of floors or crawl spaces when we leave our homes, but we do have the control of the same while at home. Make sure your floors and in fact every space your baby crawls on is dust and dirt free. A lot of allergies and diseases start right from home! Speaking of allergies, crawling babies and pets are kind of like chalk and cheese. Say what you want about how friendly your pets are, how clean they are and how much they love the baby; at the end of the day It all comes down to the health of your child. I always make sure that my pets are separated from my baby while he crawls around. I simply close the barricade, wipe the floors clean and leave the baby to play with his toys while my pet goes about his business on the other side of the room. Free interaction with my pet will be allowed only after a few years, till then I am keeping him away from fur, fangs and saliva. All the best to all those mamas who have CRAWLashians in their homes. Ladies, I feel you! And if you think this is tough…wait till he starts walking! Sigh!